Light! Two “strings” of LED lights. One to string across the only place in the Landfill Chitchen that doesn’t already have a string of LED lights. That is under the shelf right here above my laptop. I love love love my chitchen but I think in every prodject there can be small details that are overlooked or not thought of during the design process. If I had it to do again, I would have specified an LED light string under the shelf. And then there’s the Coffee Station that I wanted but didn’t quiiiite happen. Basically a planned lucky-shuckyal outlet wasn’t installed and no one (including us) noticed it until it was too late. On the positive side, Jerry (lead carpenter) neatly liberated “Mouse” (upside-down U, mind you) from the old wall. She was 2-1/2 when she started writing her name (“Mouse” with an upside-down U, mind you) everywhere including the wall and we really wanted to save it. “Jerry is a genius.” So said the GG. 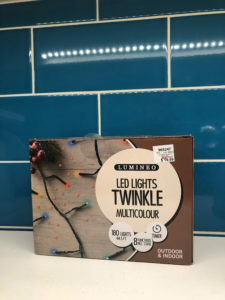 The other string is tiny LEDs (see pic) to wind along my “collection” of glass vases and bowls of all colors on top of the cabinets above the sink and stove, etc. Like my Santa collection, this is not an active collection. It is stuff that I have owned for a while or have snagged from The Comm’s stuff and a few from various deceased in-laws. I did increase it in a minor way when my Mouse found me some aubergine items for xmas but I am not “into” piling my house high with vases, etc. I needed some aubergine items but I think I have enough for now. Those light strings (and also a new nightlight, which we needed) were wonderful, thoughtful gifts, especially in the January dark and cold. Not a bad life here on The Planet Ann Arbor, knock on wood as always! This entry was posted on Thursday, January 17th, 2019 at 7:01 pm	and is filed under Uncategorized. You can follow any responses to this entry through the RSS 2.0 feed. Both comments and pings are currently closed. Those lights will be cheery–what we need in the cold, gray days of January. Not so chilly here, but definitely gray. Sounds like you got some very thoughtful bday gifts! !